Sign up for Broadjam today to follow Barefaced Liar, and be notified when they upload new stuff or update their news! 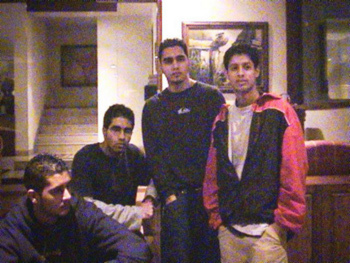 Formed in 2001 in their hometown of New Delhi, India, Barefaced Liar was the brainchild of 3 high school friends. Guitarist Sumant Balakrishnan and lead singer Akshay Chowdhry along with drummer Tushar Vig always wanted to write songs that would simply make a difference .Bassist Dushyant Purohit joined the band in May 2002. With a weak support system for touring in their country, the band since then has recorded multiple demo’s and have been working towards writing high quality songs in order to garner major label attention. Recorded in January 2004 in New Delhi, the new demo featuring 'Incline'- a lush, acoustic song laden with Indian percussion instrument- the tabla and with ‘Tether’ showcasing Indian undertones in a hard rock environment and with the energetic and melodic 'High Tide', the band has finally realized the scope of their potential. Along with a crushing live show, Barefaced Liar are aiming to make sure that they establish themselves on a global scale.